Leisurely breakfasts are my favorite. When I vacation, I want at least an hour time slot to enjoy my breakfast. The thought of just grabbing a muffin and banana and running out the door is ok for Monday-Friday (I guess) but it’s no way to enjoy a weekend morning meal. Especially when you have guests in town for the weekend! These should be relaxed, easy, meals with plenty of time for multiple cups of coffee or tea and lots of good conversation. I did some serious preparation for my weekend guests Friday. I didn’t sweep the floors. I decided the bathrooms were clean enough already. But I worked my oven! 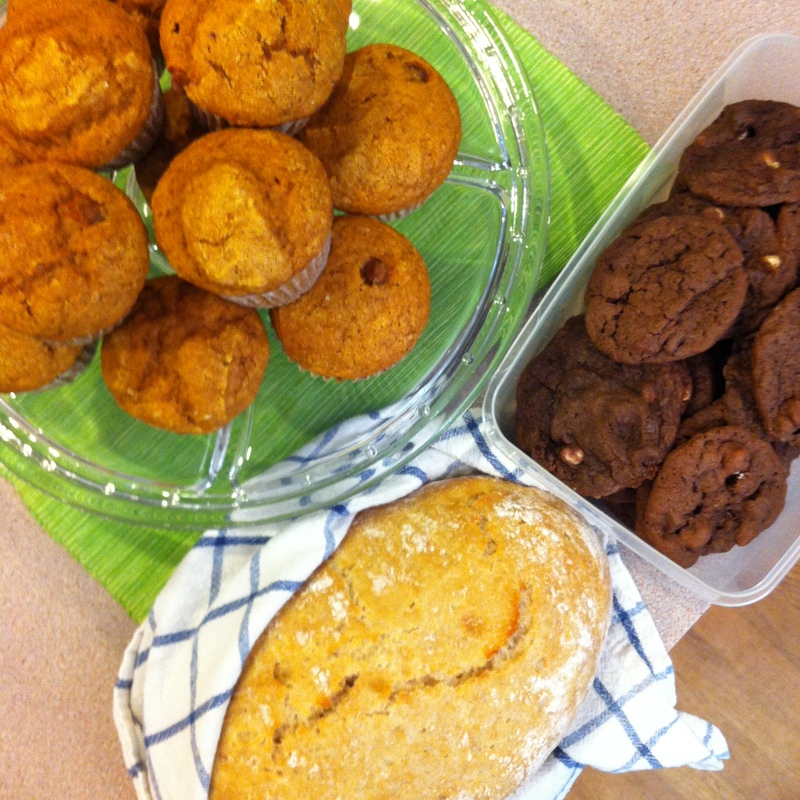 We had fresh baked bread, muffins, and cookies ready and waiting when my mother-in-law and her husband arrived. And now that it’s Monday afternoon, most of those are all gone! But it didn’t end there. I also prepared Saturday’s breakfast Friday evening. I used a recipe that a friend of mine made for a group of us when we were visiting her in Boston. It is delicious (duh) and so quick! Yes, it takes a long time to cook in the oven, but you don’t have to really do anything to it in the morning! Wake up, throw it in the oven, grab a quick shower, start the coffee, set the table, and you’re ready. No flipping pancakes at the stove for half an hour, no trying to take everyone’s egg orders and actually getting them right. It’s all in one dish. All you need to add is some fresh blueberries and you are done. The original recipe was loaded with dairy and sugar. I’m sure it’s amazing, but my friend didn’t make it “full strength” and I took it down a few more notches for my own taste. We’ve gone from a full cup of sugar in the egg mixture to just a 1/4 cup of sugar. And none of my guests (or the husband) noticed. Everyone raved, MIL’s husband took seconds, and we polished off the leftovers the next morning! Slate this recipe for the next time you host overnight guests. You and your guests will NOT be disappointed. 1. Use butter to grease a 9×13 baking pan. 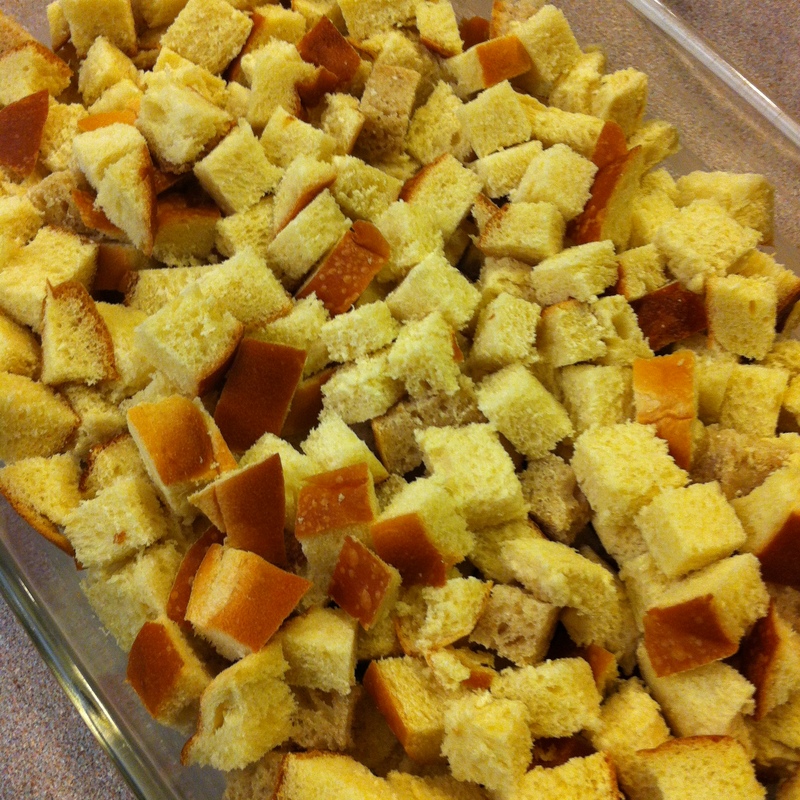 Tear or cut up the bread into bite size pieces and evenly distribute them in your pan. 2. 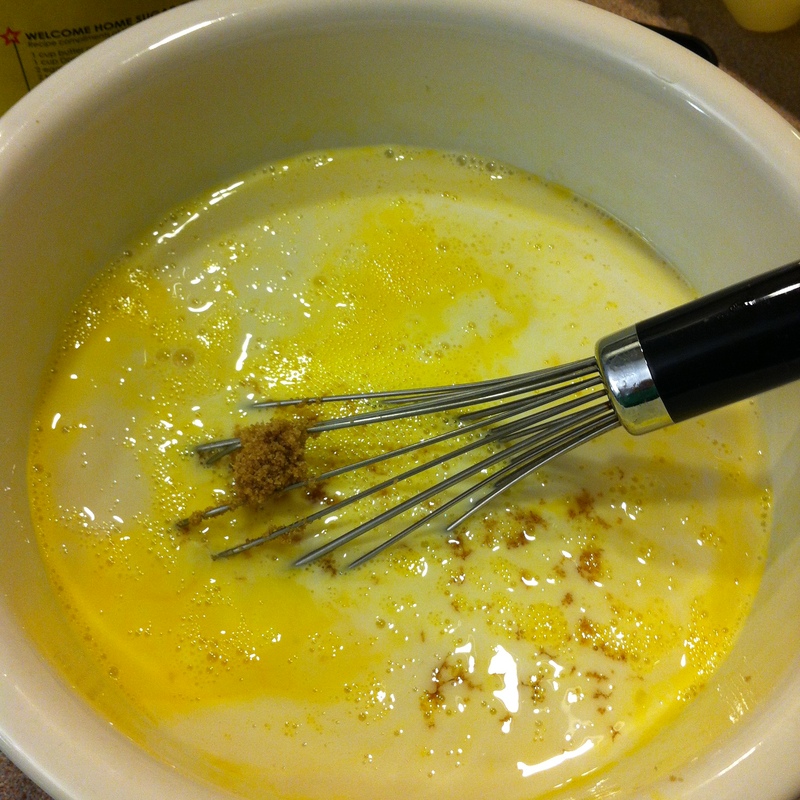 In a large bowl, whisk the eggs and add in the milk, creamer, brown sugar, and vanilla. Pour the mixture over the bread pieces. Cover the pan with a lid, foil, or plastic wrap and stick in the fridge until you are ready to bake it. 3. In a medium bowl, stir together the flour, brown sugar, cinnamon, salt, and nutmeg (if using). Use a pastry blender or two knives to cut the cold butter into the dry ingredients. Mix until the butter is the size of small pebbles. Store this in the fridge as well. 4. When you are ready to bake the french toast, preheat your oven to 350 degrees. 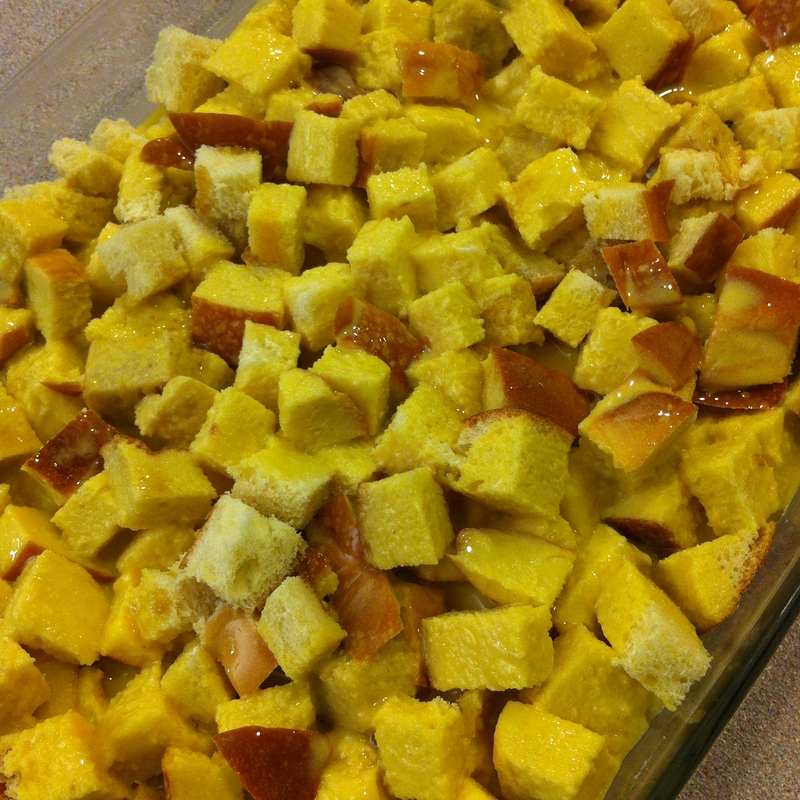 Sprinkle the topping over the bread pieces. Bake the casserole for 50 minutes. 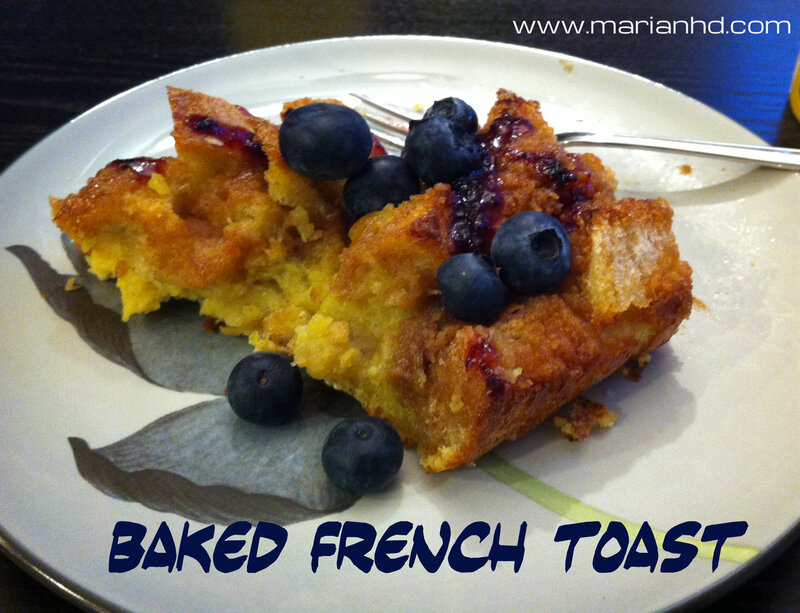 Serve the baked french toast with butter, maple syrup, and/or blueberries, as you wish. Next Post Next post: Coming soon: GMO Labeling in the US?